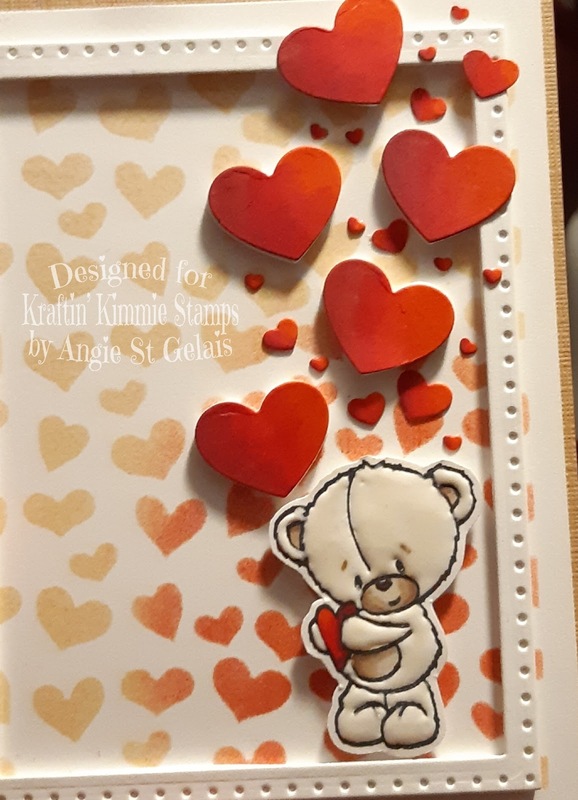 Welcome back to our second day of Krafty Peeks for the January release at Kraftin' Kimmie Stamps! Today we are spillin' ALL the tea and sharing SO many NEW goodies with you....are you ready? First up is today's super ADORABLE new stamp set from artist Melissa Baker-Nguyen! 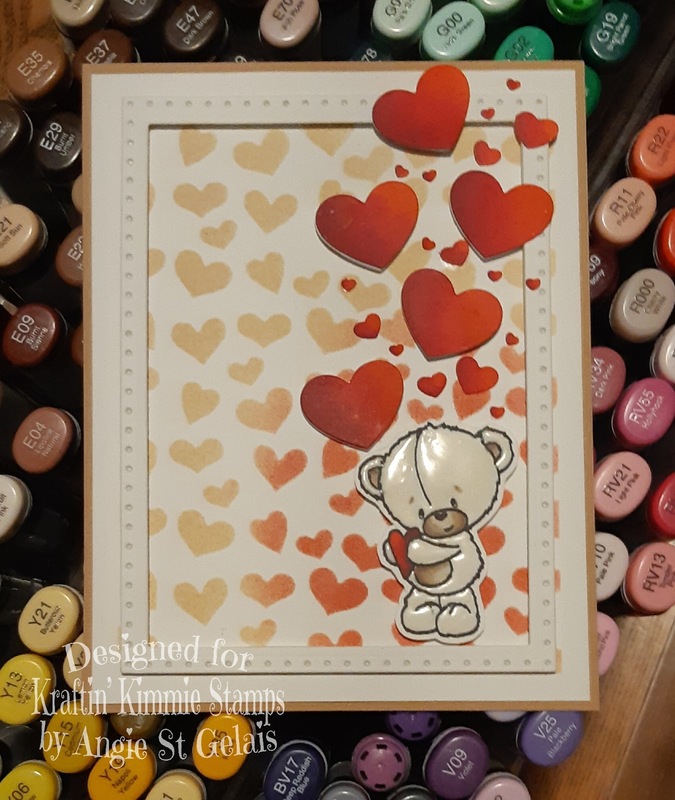 I think you'll agree with me that this set is BEARY sweet and will be great to use for many occasions! 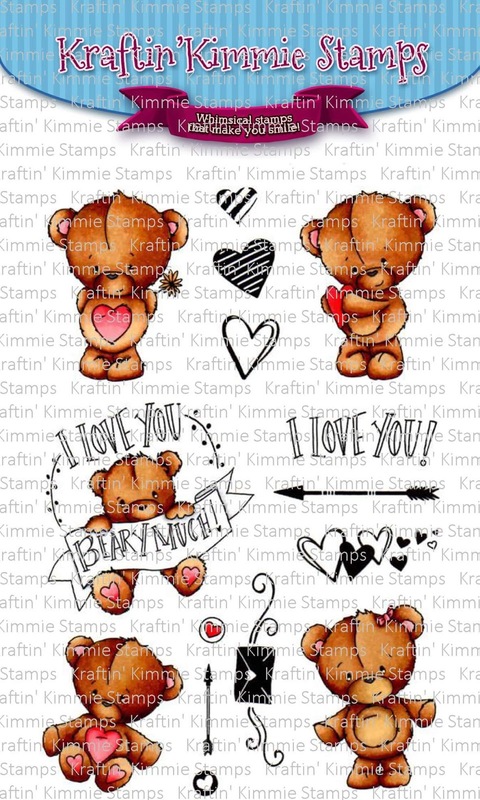 It includes five main images, a couple of sentiments and a bunch of fabby accessory stamps! Next...I bet you've been guessing about what our BRAND NEW PRODUCT might be! 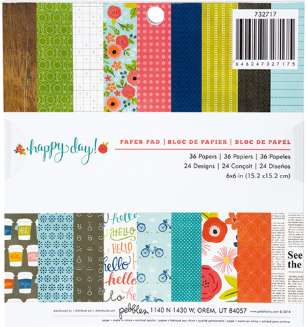 You may have even noticed them on my Day ONE release post... Well...as papercrafters we love adding that special embellishment that just finishes off our cards or scrapbook pages perfectly! For myself and many others.....that's the wonderful enamel dot!!! We are releasing TWO sets of the new DOTS this month to kick things off! First up is a set called Krafty Basic Dots which contains all the colors you should have in your arsenal.....black, white, yellow, red and blue! The second set is perfect for this release covering all shades of reds and pinks! The perfect extras to throw in your cart! How about a NEW Krafty Kolours Hybrid INK??? This month we are releasing this super sweet color called PRETTY IN PINK! Of course it comes as an ink pad, a mini cube and an ink refill! It coordinates with many of our colors and of course....can be used with our stencils!!! Stencils you say??? Why yes we DO have new ones for you this month! For January we are releasing TWO new Krafty Stencils perfect for our inks, texture pastes, glimmer pastes and more! They are Happy Hearts and Harlequin!!! You will see all these goodies in today's krafty hop (and you may have seen some of them in yesterday's hop if you were looking)! 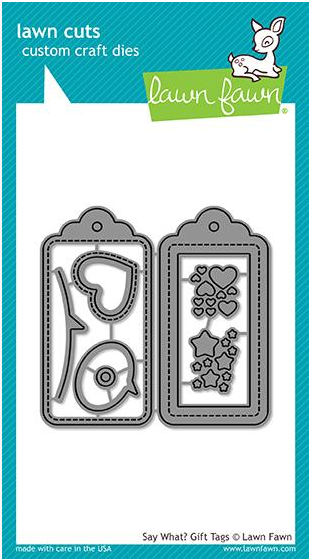 ALL of our new krafty goodies will be released at our LIVE Online Release Party on Saturday, January 12 at 2pm EST in the Krafty Friends group! 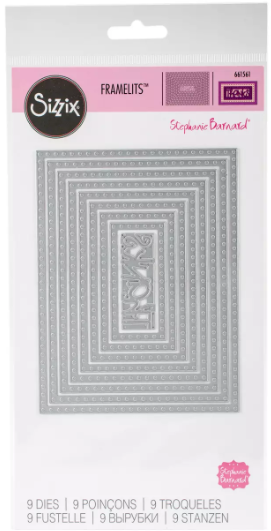 I love this stampset so much that I just had to create 2 cards for this release. 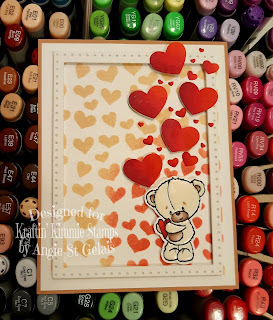 This 1st card I made using the fabulous new Happy Hearts Stencils to create my background. To achieve this look I took a piece of white 110lb coverstock and adhered the piece to my craft board using washi tape. I covered 1/4" of each side to keep the border crisp white. 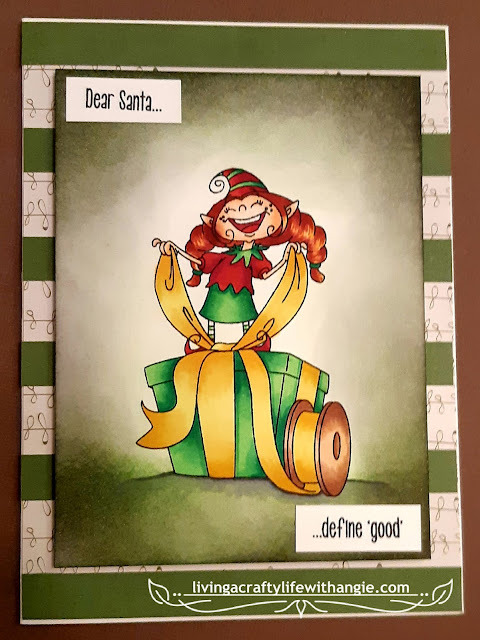 I then adhered the stencil to the piece also using washi tape and brushed on Tim Holtz Antique Linen ink across the card. I then used Tim Holtz Red Brick ink to the bottom left of the card where I intended to adhere my bear. 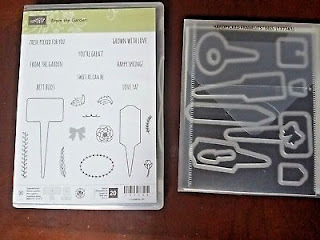 For the die cuts I created the frame using 2 nestled dies by Sizzix - Framelits Stephanie Barnard - Rectangles Dotted. 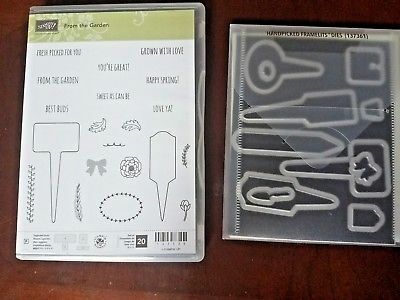 For the Die cut hearts I used the Lawn Fawn Say What? GiftTags dies. 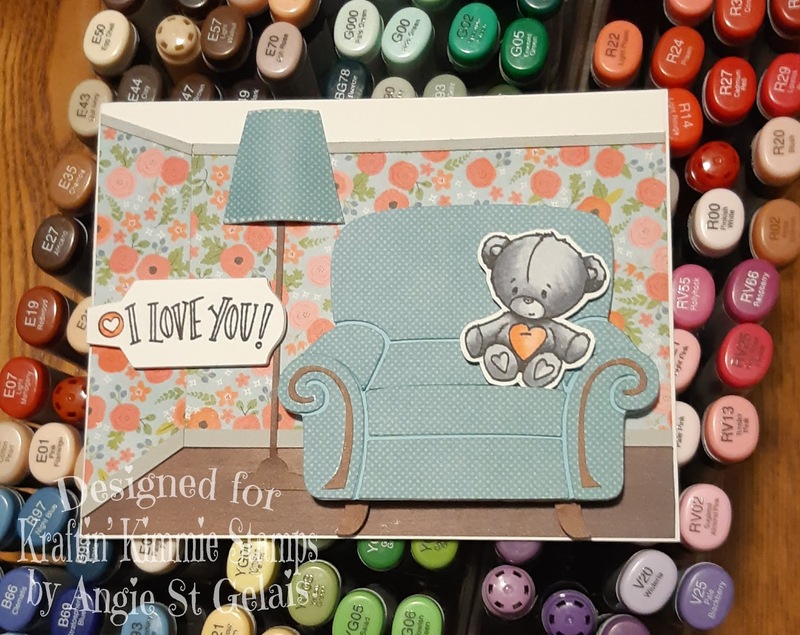 For my second card I decided to create a cute little 70's inspired living room scene. I may have wasted a lot of paper trying to figure out how to create the illusion on walls. Thankfully not my favorite sheets. I ended up finding all 3 of these patterned papers in the same paper pad. Pebbles - Happy Day! 6x6 paper pad had the wining combination. The grey baseboards and trim was made using scrap grey cardstock I had in my pile. I created the lamp and chair using the design features on my Silhouette. For the lamp shades 3D shape I pasted the right and left edges directly to the card base and used foam in the center. I added detailed dotted to the shade using Liquid Applique. The sentiment was created using a die from the Stampin Up die set called "From the Garden"
Hop around and check out the amazing samples from our incredible Krafty Team and Guests! Cute, cute, cute! 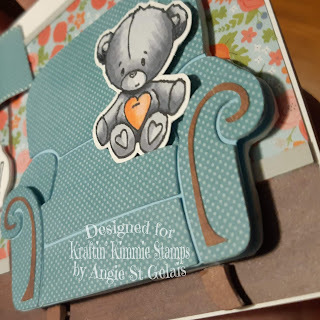 Love how you put the bear in the chair! What a neat idea! Awesome doesn't even cover it! Wow! So sweet! I Love the hearts raising about the bears head! 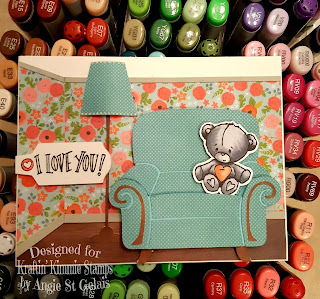 Love, love what you did with this super cute set!! The bear from your first card has so much love to give with all those hearts and what a cosy livingroom on your second card! LOVE both cards!!! The use of Liquid Applique made an adorable bear! Also love the SU die used for the sentiment tag in the 70's card. I have that die set and you have inspired new uses for using them. Love the second card soooo much! Looks so stinkin cute!